ESTEVAN, Sask. — Jennifer Jones is headed to the women's final of the Canada Cup. The Winnipeg skip jumped out to a 4-1 lead after a three-score fourth end en route to an 8-4 victory over Ottawa's Rachel Homan in the women's semifinal Saturday night. "Getting a three against such a great team changed the momentum a bit," said Jones. "We made some big shots when we needed them. Even when it got a little scary in eight we managed to hold them to two, so all-in-all, pretty happy with our performance." Despite the loss, Homan was satisfied with her team's play throughout the tournament. "We had quite a few picks in the middle (ends) and didn't quite find the lines," said Homan. "We had to keep going to new paths. But Jenn and her team played well. It was a tough one tonight, but we had a lot of really good games and I'm proud of our efforts this week." Jones' win set up a final against Kerri Einarson's rink from Gimli, Man., on Sunday. Einarson beat Jones 6-3 in the round robin. "I have to play better. I didn't play very well in the round-robin (game)," said Jones. "They're a tremendous team. Tons of great shots from them, so we'll have to be sharp from lead to skip through 10 ends." Earlier Saturday, Einarson advanced with a 7-3 win over Calgary's Chelsea Carey. On the men's side, Kevin Koe moved on to the men's final by downing Brad Gushue 7-5 in their semifinal match Saturday afternoon. Koe's team struggled early, giving up two in the second. Gushue extended his lead by stealing a deuce in the fifth end. 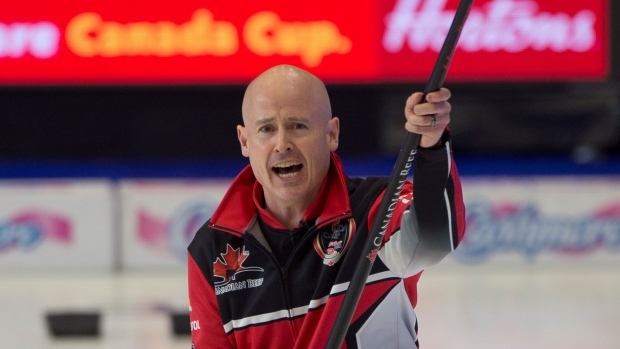 Koe began his day by beating Edmonton's Brendan Bottcher 8-7 in a third-place tiebreaker after both teams finished the round robin with 4-2 records.